Another club rhib trip was scheduled for Sunday and by the preceding Wednesday was fully subscribed showing the enthusiasm that has pervaded the club. As it turned out we did not actually take the boat out due to a few call offs and a technical problem discovered at the last minute. However, three members did decide to make the most of it and go shore diving anyway. The trip started, after a false start, with Steve and Chris descending on Tara for breakfast as Paul assembled his camera , and , having had a rather tasty sausage sandwich, spicy and succulent, in the luxurious surrounding of their new home, we headed off toward Crianlariach and on to Tyndrum where the venue for the day was settled. After a quick detour via the Isles of Skye hotel to check out the launch for a new a new dive site, we arrived at the Slates in damp but calm weather and unpacked the car. What a variety of kit came out of the car, singles, twins, and a rebreather and as expected Steve was fully kitted up and waiting for the rest of us as we completed our faff checks. Buddy checks at the water and we were off down to 20m where Paul demonstrated an almost perfect rescue from depth as a drill to complete his Advanced Lifesaver award and become a rescue specialist in doing so! Continuing the dive, we traversed around the reef reaching the point before turning and retracing our steps back to the entry site after over an hour underwater. 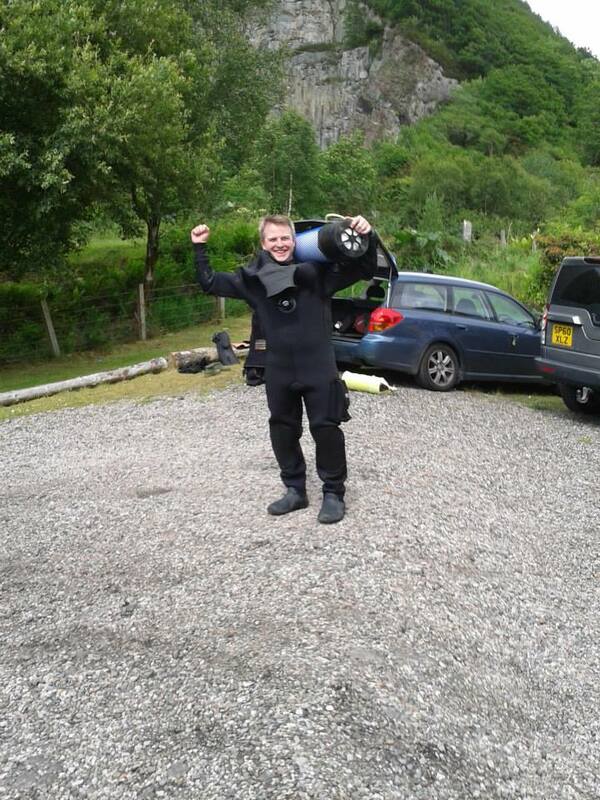 Quite remarkable was Steve’s ability to come up with a reserve in his 12l on this dive! There was some very nice fish life out today, blennies, rock cod, wrasse and pollack with all the hard surfaces covered is squidgy life. The light was quite good today and while the water had a distinctly greenish hue to it the Sea Urchins were positively shining. After a good two hour lunch break we went back in but this time went exploring in the East bay out from the slate sheds. Once out onto the slope beyond the confines of the bay, the dive is rather good. Occasional boulders provide reef habitat from nursery shoals and holes for larger fish such as the large ling that we saw , to hide in. Flat fish, scorpion fist and even if somewhat rarely, skate are seen here. The topography was at it’s best below the 20m mark (low water) at the furthest point in the dive, where small shelves and walls stepped down into the deep. It was here we turned and made our way up-slope finding a glacial slab, polished smooth by ice. 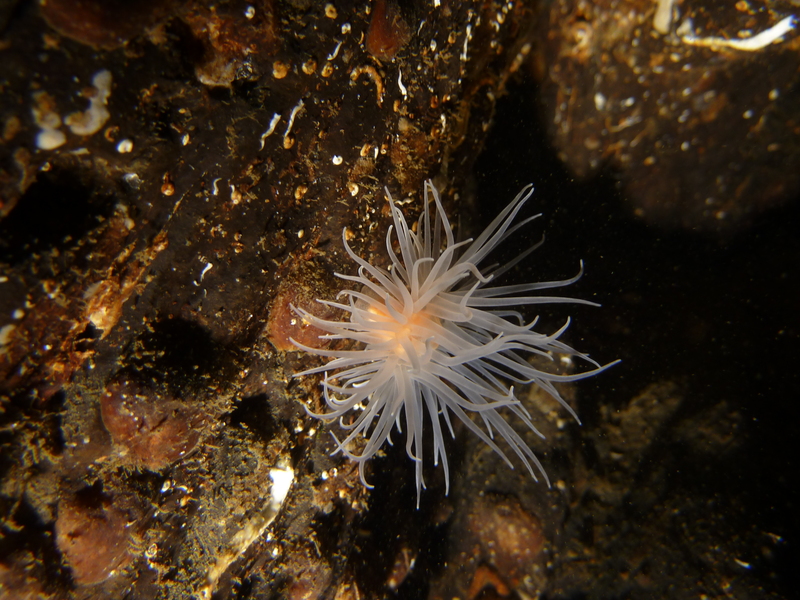 A couple of Facelina Botoniensis slowed us down for a while, presenting a wonderful photo-opportunity as they raced across the slab. Above the slab, gravel gave way to sand and kelp and the surface. A rather splendid second dive. That was it for the day, save to rush back to tea and cakes at Tara’s! The Advanced Lifesaver (ALS) skills development course is one of those SDCs that people put off doing until they have to, the reason being because it is hard work and tests a skill that we all think we are brilliant at, but are we ? Paul and Chris joined a Scotland Southern region event at Loch Long being run by Rob Sewell, the regional coach and ‘Boss’ed’ by Pete Bicheno, one of our locally active National Instructors who is always willing to help out on such events. Guy from Aberdeen and Alex from Stirling made up the rest of the course candidates. 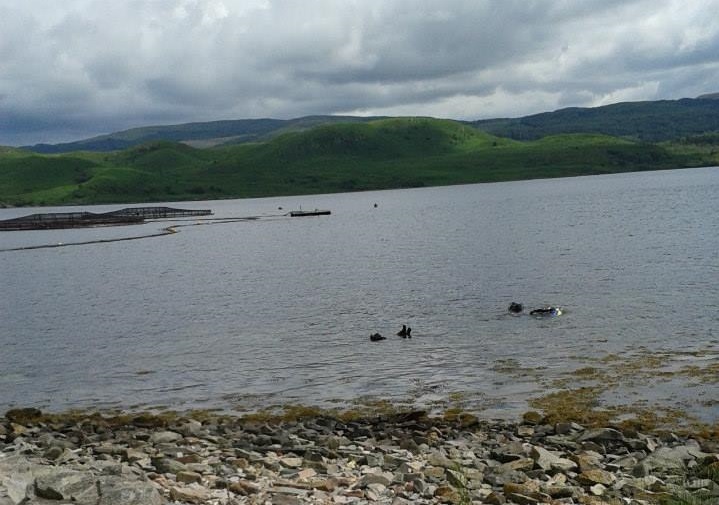 The venue switched from Largs due to the wind was the Loch Long Chalets, diving off a boat lent by Thistle divers and the conditions in the bay were fair (enough) . So what is it all about ? The ALS assesses diving lifesaver skills at a level that an Advanced Diver would be asked to perform, so rescue from a depth of 20m and following the BSAC safety principle of lifting to 6m then stopping, doing a safety stop, ascending normally to recommence the rescue drill once on the surface. Of course diving in Loch Long you will always have the challenge of low vis and darkness which adds a degree of realism to the proceedings. Once on the surface, recovery to both boat and then to the shore after an exhausting 100m tow with rescue breaths which was undoubtedly the most strenuous diving activity I’ve done in years. Landing a casually on your own putting them in a recover position and then, using a manikin, provide Basic Life Support until assistance arrives. All these skills we have covered many times during our training, but the effectiveness of the course is that it provides a scenario where you link the skills in their natural order and thereby providing a realistic vehicle for assessment. And yes it is an assessment, not a teaching course! Additional, written , verbal and first aid scenarios finished the day after we had recovered the boats and changed into dry clothing and moved into the rather nice cafe at the Chalet reception and shop. So what was my opinion and thoughts on the day ? Firstly and to be completely honest I could have done much better! I felt rusty and slow on the practical aspects and my theory was not quick enough. So here are my areas for improvement ! On the lift, I could not see my computer so was using the shot / datum to gauge my ascent rate. That was fine but I was late in stopping at 6m. Next time, I’ll switch the back light on or perhaps just learning how to turn it on would be a good idea. Usually I just shine my torch on it but not enough hands to do that during a lift. Lifting people into the boat , need to review different techniques and practice parbuckling. Throwing and non-contact rescues, all good stuff. No problem for the men! Towing and rescue breaths while making a good seal, practice practice and practice! You can always do better and a 100m tow is a long long way! Fitness could be better as it impacts effectiveness of technique. Landing, need to do this without trying to break peoples arms and should note that techniques will differ and are dependent on the ease of the exit, so learn more than one. Recovery position: How can you get this wrong……? very easily, let me explain! Well it wasn’t really wrong, it was just another way of doing it! BLS practice, practice and practice again, again was far too rusty for comfort, but it did get better as I got into it. Good extension, checked for effective breaths and lots of ‘Nellie the elephant’ and ‘Staying Alive’… casualty assessment every…. If anyone was interested in doing this assessment, I’d either recommend being 100% up to date with your practice or a complete refresher session beforehand, it’s the full on nature of the exercise that is so useful and at the same time so challenging. All in all a very worthwhile event. Thanks are due to Rob and Pete for managing it and to Thistle Divers for the use of their boat. For prospective Advance Diver candidates this is a really good course which covers off several requirements in the training syllabus, for other diver, unless you have an alternative requirement to do it, it is very hard work , a good level set of your rescue skills and ultimately very rewarding. Crail was definitely cooler than Perth when we traveled across for an evening dive and BBQ, by almost 10°C in fact ! It looked deceptively calm with small waves breaking on the reefs as a high tide filled the gullies. With a strong snorkeling contingent exploring Fifeness harbour (sic.) five divers kitted up to explore the gully below the WWII pillbox at the Coastguard station (now closed). After a few hiccups with direct feed hoses that didn’t fit and needed to be swapped, we were off in two groups to explore and dependent on the vis, throw in a few drills for the Ocean diver trainees. 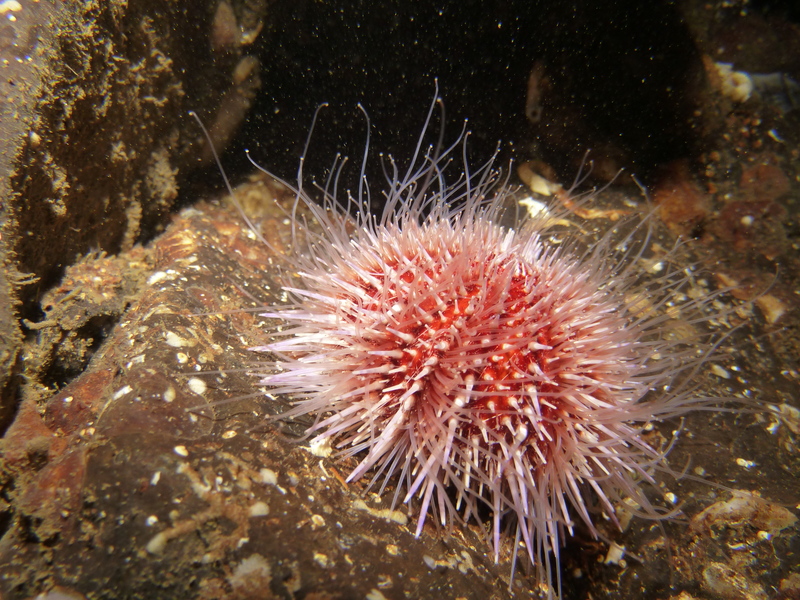 Chris and Aileen managed to slip off first and having been helped into the water by Gary found excellent vis above a sandy bottom and large brown kelp covering the rocks. Picking up the reef the colorful life was appreciated and a lobster tickled. This turned out to be a recently molted male, with a soft carapace so was returned unharmed. The brightly colored Galathea squat lobster was abundant hiding as they do in cracks and on the underside of overhangs. A good show of fish life hovering at the limit of visibility also made life interesting. Last winter’s storms seemed to have scoured the boulders a little and much more kelp was present that I can remember and loads of wreckage, rusted spares and plate fragments littered the sea bed adjacent to the reef. All interesting stuff. We turned with ample air in reserve as Aileen was having a leaking mask day and returned to find a sandy bottom to practice AS drills and ‘ellami calls. No real issues were experienced but it would have been much easier without a flooded mask, still if you have confidence enough to rescue someone when things are not going well you are doing better than most! The second team, Duane, Andy and Steve, followed us out, passing us towards the end of the reef. Again they reported good and varied life including lobsters of various shapes and sizes and found time to complete AS drills, another good result. Returning to the shore, we were landed by Gary and Izzy who were providing shore cover and once everyone was back on dry land we joined the BBQ throwing our sausages on the monster grill that Neil had brought. Chat, stick throwing for the dogs and a chance to catch up and meet various family members saw us spend a hour or so before approaching storm clouds, a drop in temperature and the fading light saw the party disperse. 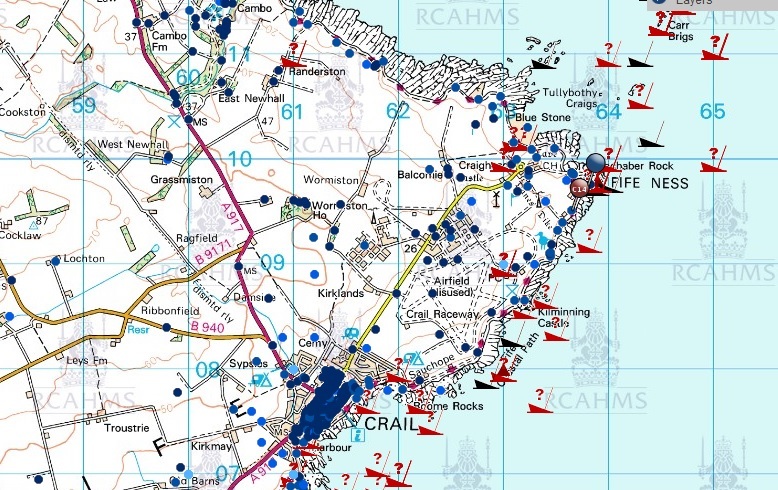 this extract from RCAHM shows all the wrecks that have come to grief on this part of the coast. It’s a fact of life that the more you put in to something, the more you get out and this was very obvious at this months DTP at Loch Fyne. With the holiday season upon us and with other folk washing their hair Perth_BSAC provided the lion’s share of the instructor and people prepared to muck in and help out. Only fair really as we also took most trainees! On what can only be described as a fantastic west-coast day with a flat calm sea, warm water and good vis the Perth club had three sessions running. Firstly a drysuit and buoyancy familiarization being led by Chirs and an Ocean diver completing his dive Leader lesson under Steve’s watchful gaze with another buddy pair practicing their navigation and buoyancy within the confines of the bay. One other pair from Dundee were undertaking Sports diver training under Edward Haynes’ watchful gaze. All the hard work was today rewarded with firstly a good session being completed covering drysuits and buoyancy culminating in two exploratory dives where the new skills were put into practice. Steve was set a hard task and asked to teach dive leading to a team consisting of an Ocean Diver and a Dive Leader trainee. By running the Dive leader sessions as examples of best practice our Ocean diver had some of the most comprehensive training for his grade possible. Well done to Steve for his innovative approach, clearly an Advanced Instructor in waiting ! Edward reported varying levels of success with his trainees who struggled with deco stops partly due in part to a poorly fitting drysuit and using skills no longer part of the BSAC syllabus and seldom practiced (never a good idea on an assessment). A greater emphasis will be seen here in upcoming months as BSAC reviews buoyancy skills in training. All in all a very good event with some good diving and with a diver competing his Ocean Diver practical sessions, a very good result. Two divers ventured out on Sunday. Leaving Perth in glorious spring weather, by Crieff we were in cloud and by the time we were driving down Loch Lomondside it was raining. The Pit Stop cafe was the start point for the day where we finalised our plans and having had a bacon roll and a coffee drove down to ‘The Caves’ where much to our surprise we came across some friends from the Regional training. Today was a check out dive for the upcoming Trimix course that both Steve and I were doing and as Steve chuckled mercilessly I struggled down the culvert with a twin set and stage to arrive at the waters edge exhausted…. Back to the Pit Stop for a cup of tea and a piece of cake and then a delightful drive to Loch Fyne to check out the access to some dive sites and then across to Taynuilt on Loch Etive where I introduced Steve to the delightful little wreck of the Chana. Loch Etive was dark today and the water temp struggled to reach 7 degree but once on the wreck visibility was good enough to see all we needed to as we explored. I had the chance to have a close look at feeding Horse muscles and a cheeky little blenny that had made a home in a pipe hole. Hatches, rudders, props and wheel were all checked and the little portable generator on the deck made an interesting discovery. Having circled the wreck twice we made took a bearing for the shore and made our way back via the bottles and rubbish that has piled up hereabouts over the ages. A tea pot and a wine glass stopped us for a while before we surfaced slightly further along the shore than we had planned. The trip home was broken at Crianlariach before arriving home somewhat later than usual but today we had been exploring !